Korean Pop (K-Pop) singers hairstyles have been extracted from several K-Pop groups. One group with several stylish artists is JYJ. Hero Jaejoong (a vocalist in the group JYJ) is also known as Young Woong Jae Joong. His hair is often a razored crop, but he has also been seen in a shoulder-length layered style. Performance styles show him in a long platinum faux hawk. Sometimes his hair color is reddish. Xiah is the stage name of Kim Junsu. He currently is a popular performer with DBSK. His mid-length hair can be worn in a faux hawk or a side-brushed smooth look which leaves the ears uncovered. Big Bang artists include Taeyang, G-Dragon, T. O. P., Daesung, and Seungri. Taeyang is the stage name for Dong Youngbae. His hairstyle is a mid-length faux hawk with very short sides and a shaved line accenting the rising forehead. G-Dragon is the stage name of Kwon Ji Yong. As part of the promotional efforts for his “Heartbreaker” album, he dyed his hair blond. More recently he has been seen in a nearly shaved-head style. Choi Seung-hyun is known by the stage name of T. O. P. His hair recently was coaxed into a new style and color. It is long on top, standing upright and silver in color. The sides are somewhat shorter and combed back from the face. 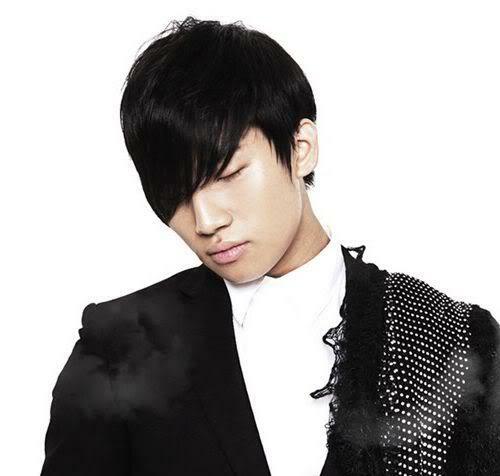 Kang Daesung has had several similar styles consisting of long side-swept bangs extending completely over the right eye. Several colors ranging from brown to red to black. For a time reddish highlights topped a curly style. Seungri is the stage name for Lee Seung-hyun. As with most of the other K-pop artists, he has multiple talents. The Super Junior group and its various sub-groups are wildly popular in Korea, China and Japan. Choi Siwon or Si Won has been seen in a variety of hairstyles, including a clubbed spray at mid level on the back of his head. Another look pulls the top hair back loosely while the sides and the back remain free. He has also appeared in photo shoots with very sculptured and smooth hair in a slight right side flow from the forehead to the back of the neck in a single line. Cho Kyuhyun is the youngest member of Super Junior. His mid-length layered look features eyebrow-brushing locks. A short style features a short full look that leaves his face free. The range of colors is less extreme than with some of the other singers. 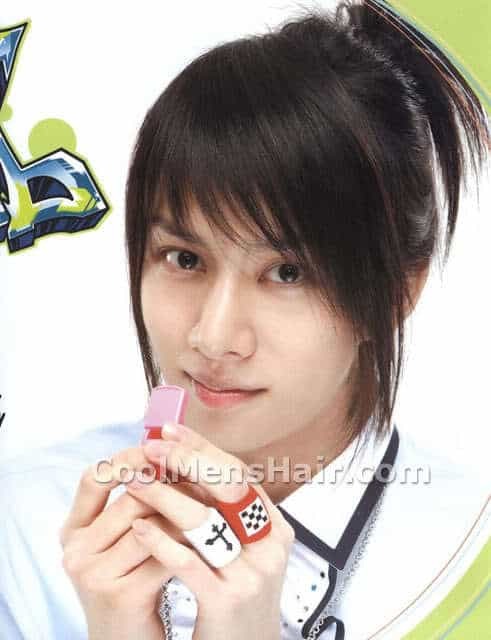 Kim Heechul is an early member of the group, best known for his dance moves. He was seriously injured in a 2006 car accident with several other group members. His hair was long straight with long sideburns and Currently he is serving light duty military service, so his hair is a typical military buzz cut. Park Jung-su is known by his stage name Leeteuk meaning “special” to avoid confusion with veteran Korean actress Park Jeung-su. His hair is medium length and smooth. His style features a fair amount of fullness on top. 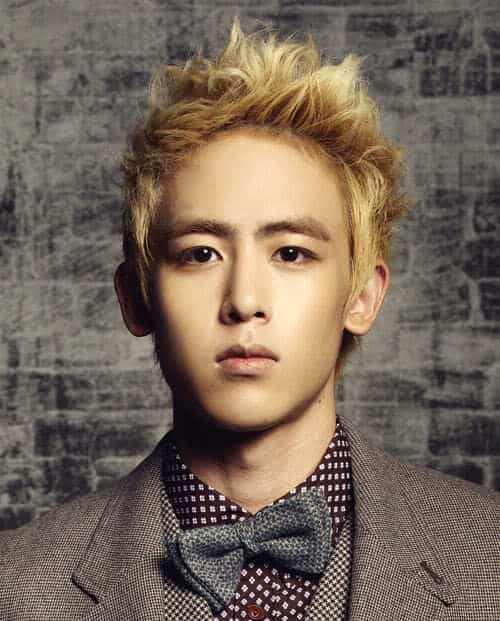 One of the 2PM hairstyle icons is Nichkhun Horvejkul. His hair is mid-length and he has sported a variety of styles, including spiky, full layered bangs, etc. The colors range from dark brown, to light brown, to red, to blonde, to streaked. Taecyeon or Ok Taec-Yeon is the lead rapper in the group. His hair styles almost always feature a back-swept spikey look, leaving the face clear. The colors have changed within a narrow range. Solo artist, Lee Seung Gi had his first hit album with a single “Because You’re My Girl” in 2004. His rich voice has made him widely popular in the K-pop genre. An unusual self-styled center part showed up in a short tour and film session. Generally, his hair is dark and is a smooth cap short medium length with no part, with full sideburns. SS501 has Kim Hyun Joong as a representative. He is known for his acting roles in Korean television. He is considered to be a fashion icon. His 2011 hair style is a rich mid-length golden brown with side swept bangs. This performer is noted for his frequent changes in hair color. Kim Tae-Woo is lead singer for a very popular group known as g. O. D. Or Groove Overdose. He interrupted his career in 2019 to serve his two-year military service. In 2009 he released his album “T-virus”. His hair is medium length crew cut. Lee Gi-kwang currently is part of the group Beast. Prior to his debut, the performer had curly long hair which another member of the group described as looking like “black bean noodles”. His smooth cap in either black or brown, is a close-to-the-head hair design. Lee Jinki is known by his stage name, Onew when he performs with SHINee. Onew’s hair ranges in color from light brown to red to black. It is a mid-length side-swept style with a partially covered right eye. Kim Jonghyun is also part of the SHINee five-member group and has also become a member of the newly formed SM The Ballad group. His soft, mid-length hair style features no parts and is reddish brown. The side hair just brushes the tops of his ears and has long shaped sideburns to earlobe length. Shim Changmin, is part of the group known as TVXQ, Korean Pop singers. He has thick hair, often in a short soft style. Most of his forehead is clear from a right-sweeping style. Park Jin Young hairstyle. Photo by TVReport. Park Jin Young is both an artist and currently the CEO of JYP Entertainment. Previously, he has been a singer, dancer, songwriter, and producer. His hairstyle is short on the sides, with a medium-length brush cut on the top. His hair doesn’t cover the face at all. Jung Ji-Hoon, under his stage name Rain, is involved in many aspects of the music industry. Not only is he a performer, but he is CEO his own entertainment company, J Tune Entertainment. He is known for his wispy layered hairstyle. He announced plans to enter the military on October 11, 2011, so his current hairstyle is undoubtedly a short military haircut. K-Pop hairstyles are exciting and in most cases, easy care. These artists tend to change hair color more often than artists in other parts of the world. Variety and exciting energy is part of each style.